You've all heard of Where's Wally, and now it's time to find Dennis the Menace (and Gnasher)! 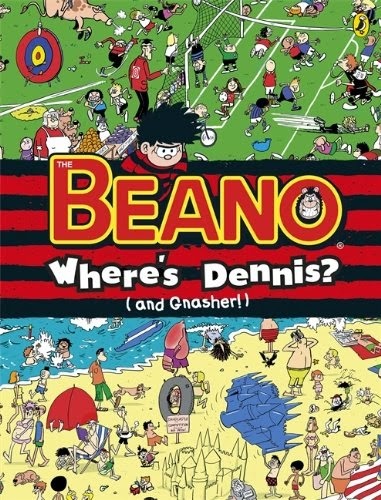 Coming out with the annuals in August is Where's Dennis (and Gnasher), a Where's Wally style book illustrated rather wonderfully by Will Dawbarn. Will's artwork is fantastic - I loved his stuff in the latest Dandy annual so I'm sure this book will be beautiful. It comes out on 7th August 2014 and will cost £8.99. 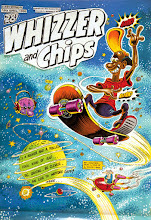 that there is a Whizzer and Chips front cover that was never seen? 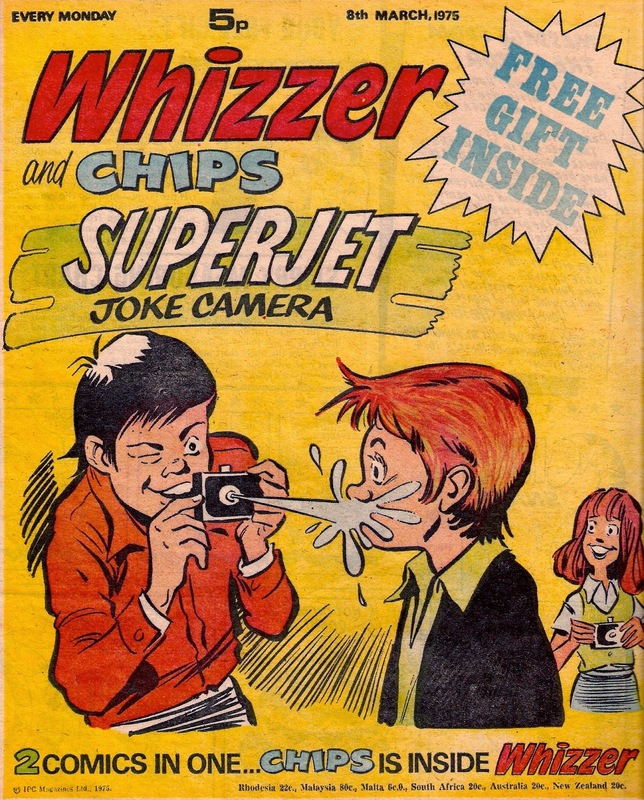 The issue of Whizzer and Chips dated 8th March 1975 came with a free Superjet Joke Camera. A great promotional piece - except that it was actually supposed to come with Joker's Plate-Wobbler. The editor claims that there was simply a delay but no plate wobbler was ever given away in the title's run so I suspect they simply ordered it wrong or got an incorrect delivery. 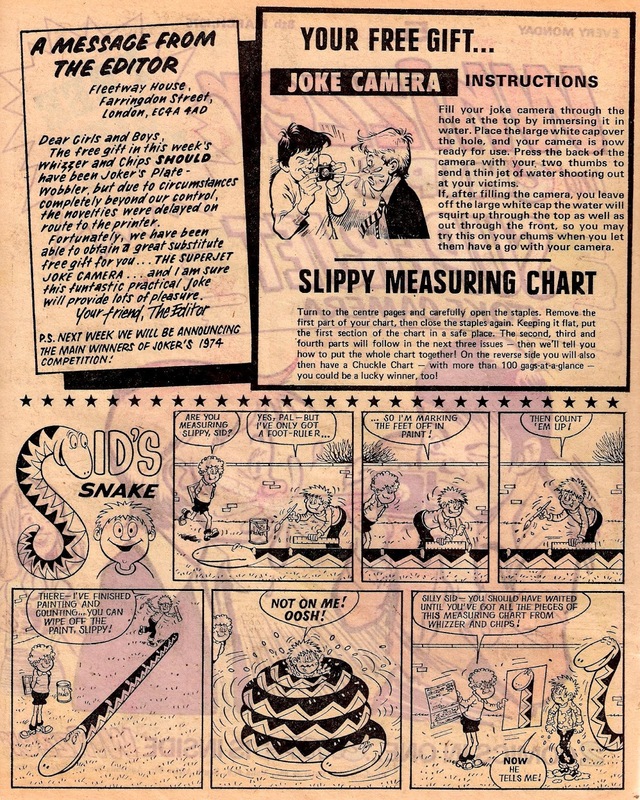 That week also came with part one of the Slippy Measuring Chart, which was given away as a pull-out on the center pages over four weeks. The Sid's Snake strip below the letter advertises this poster. 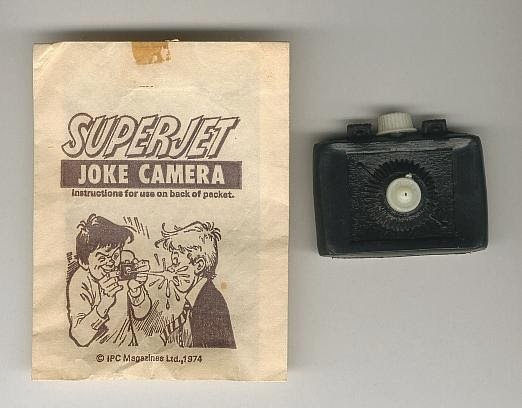 The replacement gift for the plate wobbler was, as the name states, a joke camera that squirted water when you pressed the button to pretend to take a photo. Joker used the intended free gift in his strip on the back page. If you look closely you can see that a few words have been wiped out in several panels. I suspect the words "free gift" or something similar have been poorly erased from the top right panel. 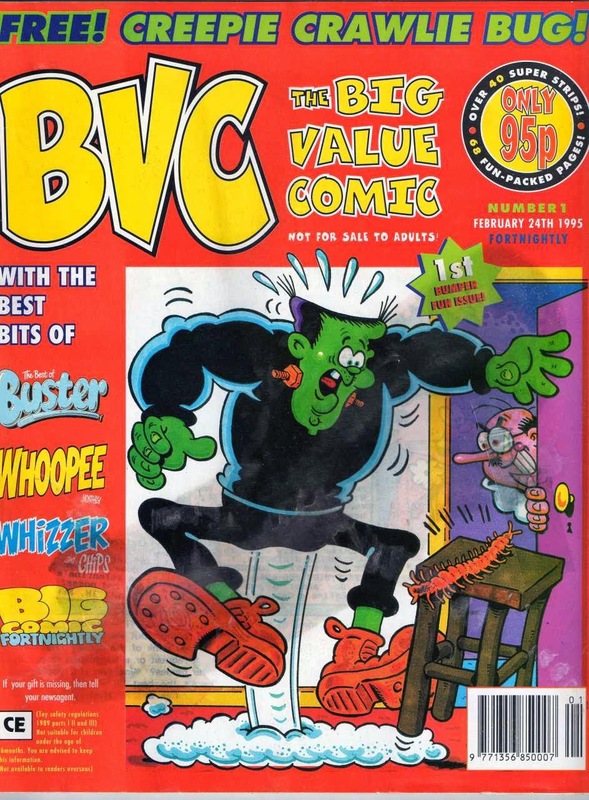 Launched in February 1995, Fleetway obviously had high hopes for BVC (Big Value Comic) because they cancelled Buster Monthly, Whoopee Monthly, Whizzer and Chips Monthly and Big Comic Fortnightly (by now Big Comic Monthly - see previous post) to merge, in a way, into it, in order to attract readers from all four titles. 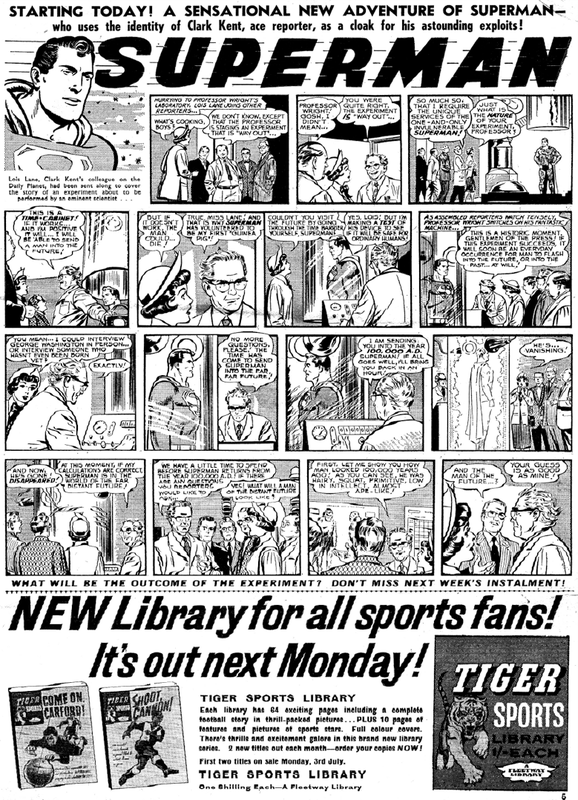 A four-page flyer was given out to advertise issue one, tucked away in the merging comics and, I'd imagine, also Buster. Strangely pages three and four are only half the width of pages one and two. As you can see the two covers are very different. 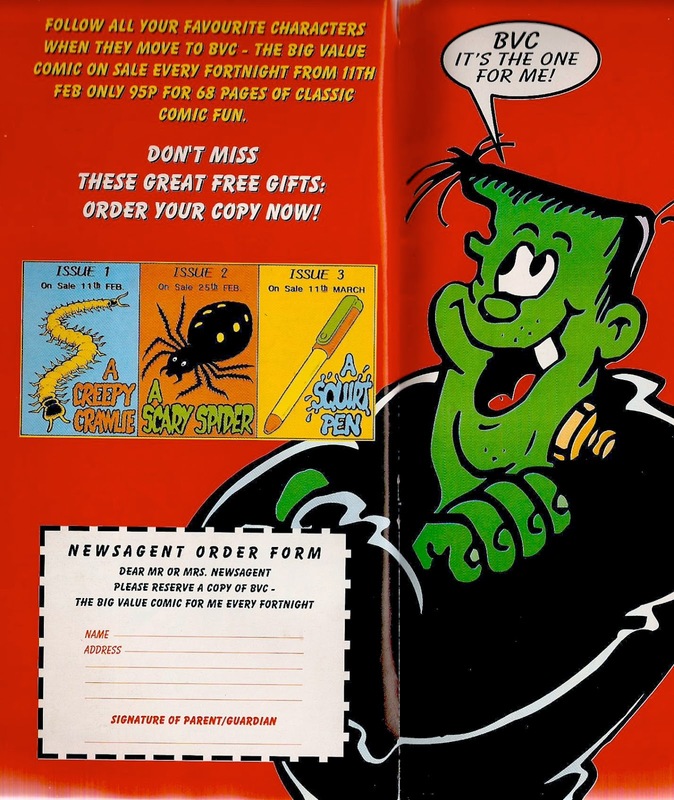 On the published version, besides the red background, the price has a black circle around it, the strapline was changed, the date and issue number were moved as was "Not On Sale To Adults!" and a star with "1st Bumper Fun Issue!" written inside it was added. Quite a significant number of changes. 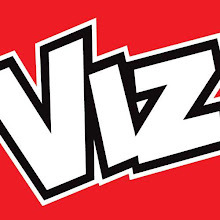 Big Value Comic didn't last long, and in November that same year it was cancelled without notice, replaced by Buster Classics in February 1996 (which ended in September 1996). Information on Fleetway's Big Comic Fortnightly seems rather difficult to find, so I've decided to write a brief summary of the information I know. 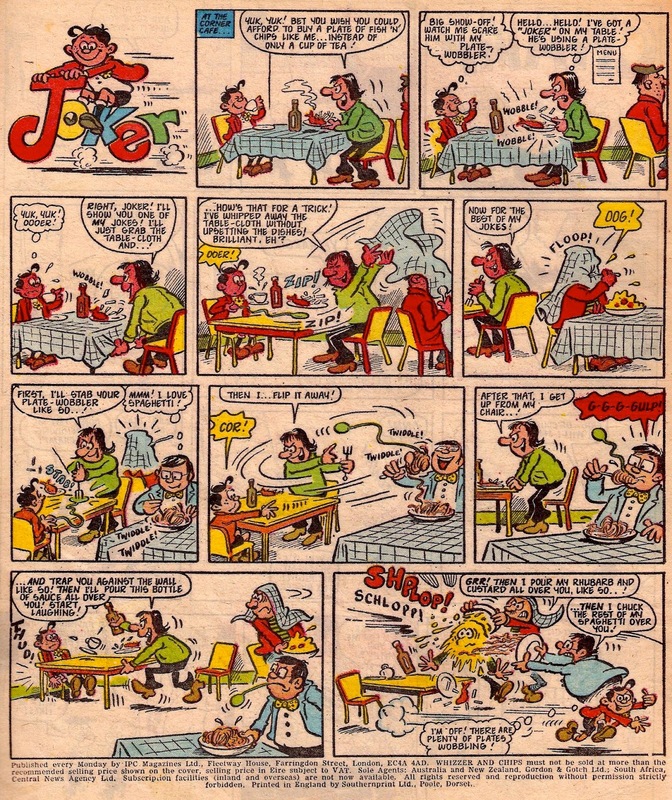 Big Comic Fortnightly began with the first issue dated 11th/24th June 1988, and was a complete reprint comic using strips from Buster, Whizzer and Chips and Whoopee. As the title suggest, it was on sale for two weeks and every issue boasted 52 pages for 35p - a bargain! The price rose steadily over time from 35p to 40p, and then again to 45p, by 1991 it cost 50p, in 1993 it cost 55p and then a year later it cost 70p! Occasionally Big Comic came with a free gift such as a badge or a balloon (as advertised above), but these were a rare treat. The first issue didn't come with a gift, unusual for a new Fleetway comic. Most sources seem to say that Big Comic Fortnightly folded in 1994 but this isn't true, it actually changed to Big Comic Monthly in 1995. 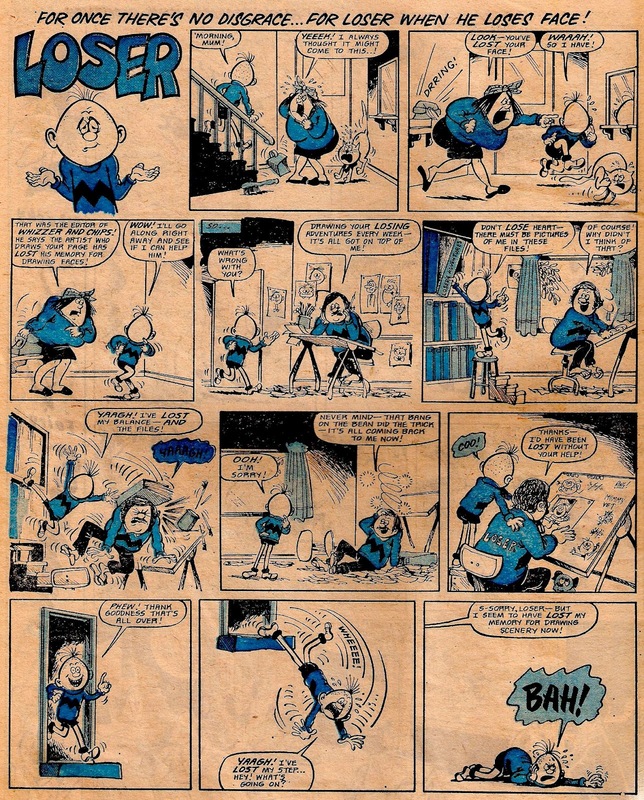 I believe there is only one issue of Big Comic Monthly, numbered #170 (to continue on with Big Comic Fortnightly's numbering), before it was replaced by BVC. Unfortunately my copy of Big Comic Monthly has had a sticker placed over the price, but I think it says £1.20. Big Comic Monthly did almost double its page count to 100 though, so the price wasn't too ridiculous. Back in 2012 Royal Mail released a set of stamps with British comic covers on them. This was a very nice set and as far as I was aware the only time a British comic set had been made. 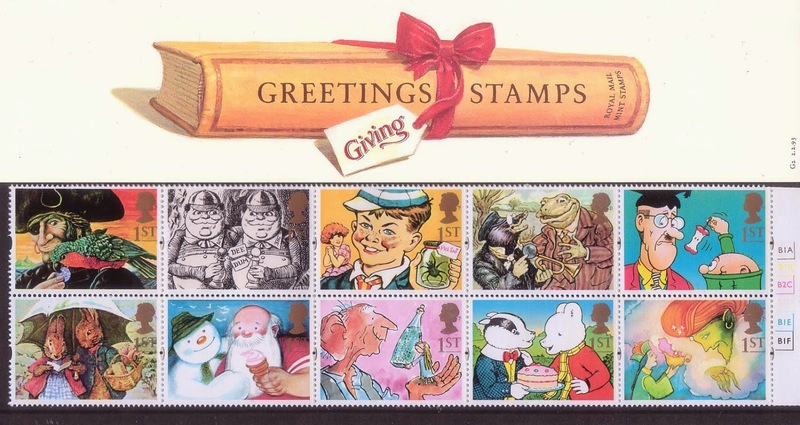 However, back in 1993 Royal Mail issued 'Greetings Stamps', a set of ten stamps that featured illustrations of famous characters including Rupert the Bear, William (from the William books) and Wilfred and Teacher, from The Bash Street Kids! Yes, Wilfred and Teacher got first class treatment with this stamp, which features Wilfred teasing Teacher with an apple. Artwork is by David Sutherland. 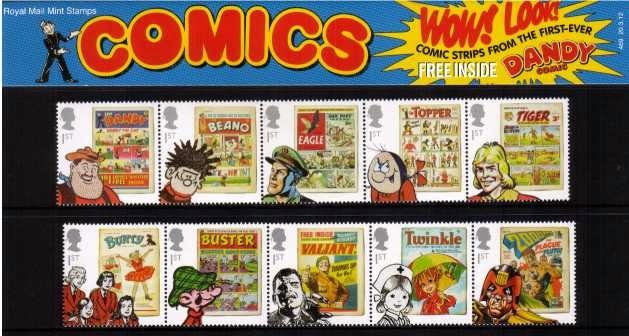 I'm not sure if British comics or characters have featured on any other stamps, these are the only two occasions I am aware of but if you do know of any more please leave a comment in the comments section below. The postcard accompanying the stamp. The actual stamp can be seen at the top of this post. I like to post any artist's self-portraits whenever I come across them and I've just found another one from a 1974 issue of Whizzer and Chips. 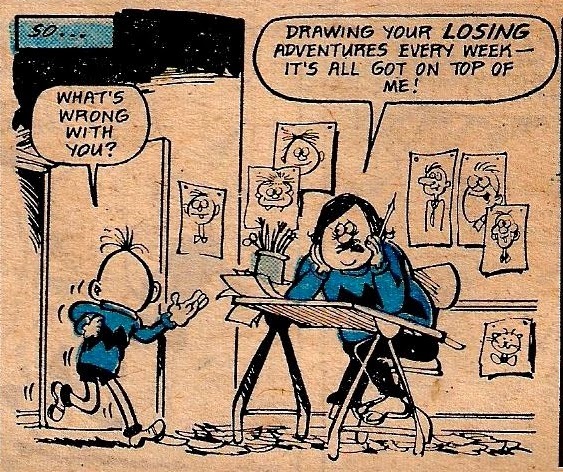 Tony Goffe was the regular illustrator of Loser, the boy who loses everything, and in this issue Tony loses his memory of Loser - forgetting how to draw his face! You may also notice in this strip that both Tony and Loser where the same jumper, except Tony's says 'Loser' on the back. As always, click on the image and then click again to view in full size. 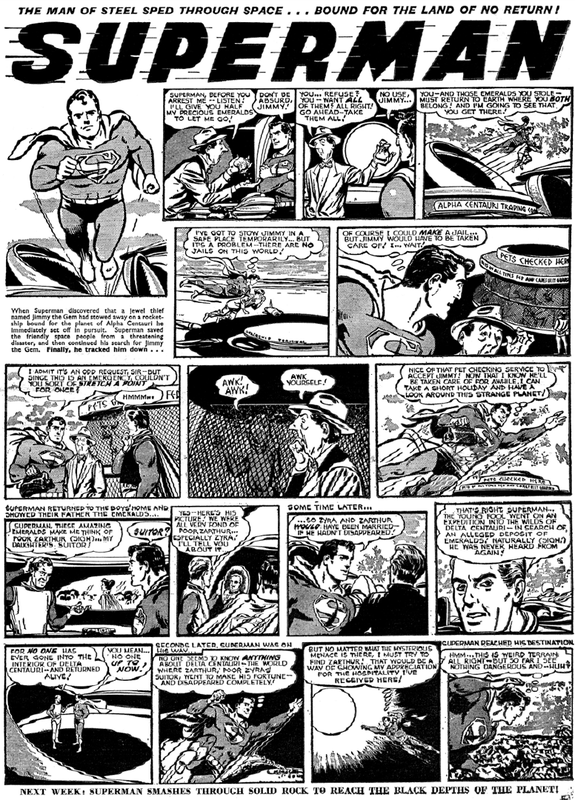 Superman was ever popular in the U.S.A and still is today, with the latest Superman film piling up over $650,000,000 USD, so it seemed obvious for comic publishers in the U.K to try his strips out over here, using American reprints. His first appearance in Britain was in 1939 when he appeared in Triumph. Although he was kicked from the paper after only a short run in 1940, it wasn't the last time he would be seen. He appeared again almost two decades later in 1959 when he braced the pages of Radio Fun. 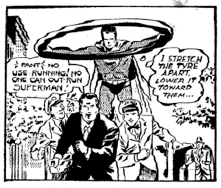 Here he would enjoy a much more popular run and would continue right up until the title folded in 1961 when Radio Fun merged into Buster, and Superman went with it. However, despite his success with Radio Fun readers he didn't fit in with the Buster fans and his strip was cancelled that same year. He would appear again in 1969 in the now-scarce Super DC comics, which lasted for less than a year - producing just 14 issues and one annual. 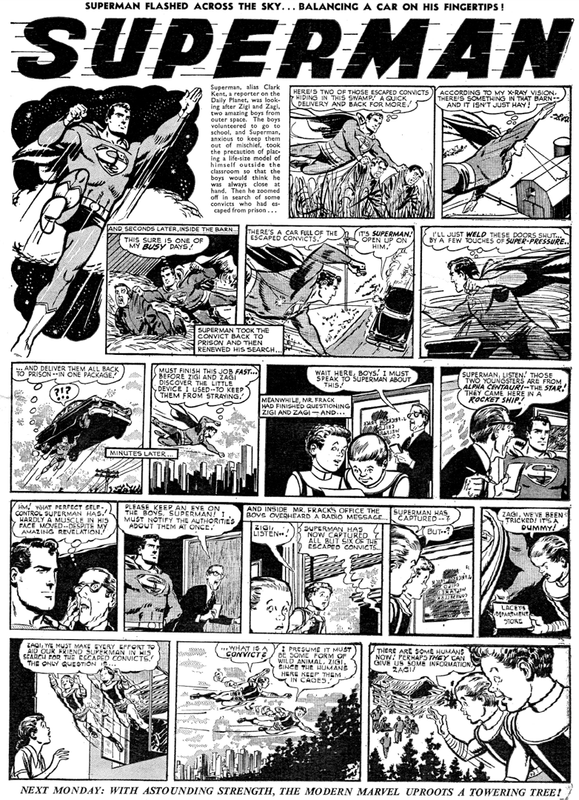 London Editions would try their hand with the character by featuring him in Super Heroes, but he was there for just two years. 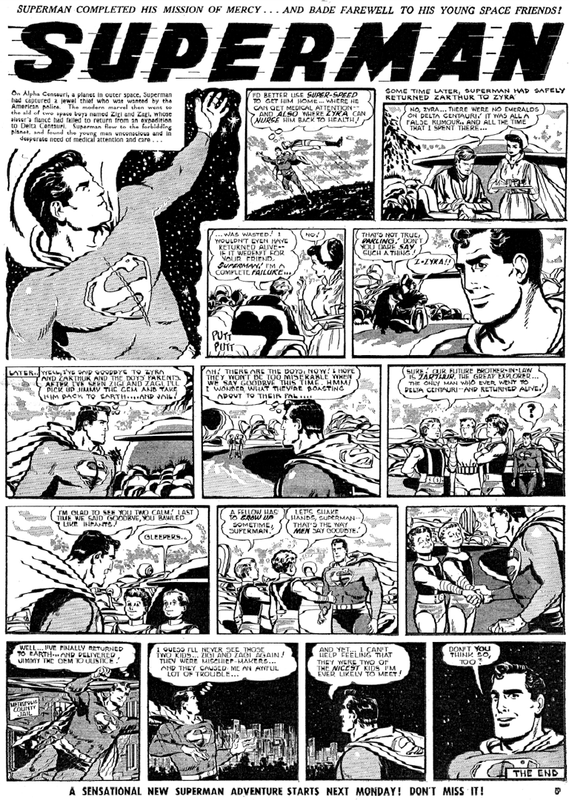 All the scans featured here are from Superman's short run in Buster comic. I am personally not too keen on the Superman strips myself, I prefer the humorous British super heroes such as Super Dad, Super Mum and Full O' Beans, to name three, but I'm sure they appeal to many others. Four New Whizz-Kids and Chip-Ites! 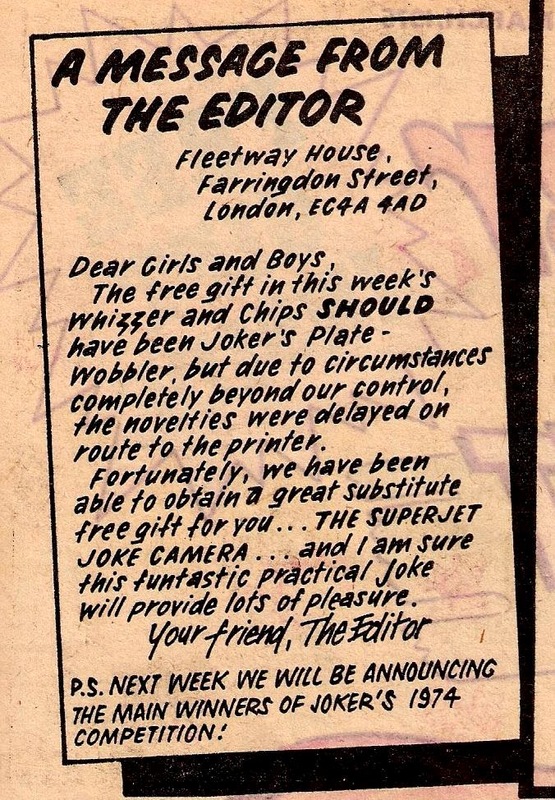 I've covered the issue of Whizzer and Chips dated 21st February 1970 on this blog before, when I wrote about the free gift it was presented with (see this post here). It is time now to return to it once again, not for the free novelty but the strips inside it, for this issue gave birth to not one, not two but four new characters! Two of these characters appeared in Whizzer and the other two in Chips, and since Whizzer is the first half of Whizzer and Chips we'll look at those characters first. 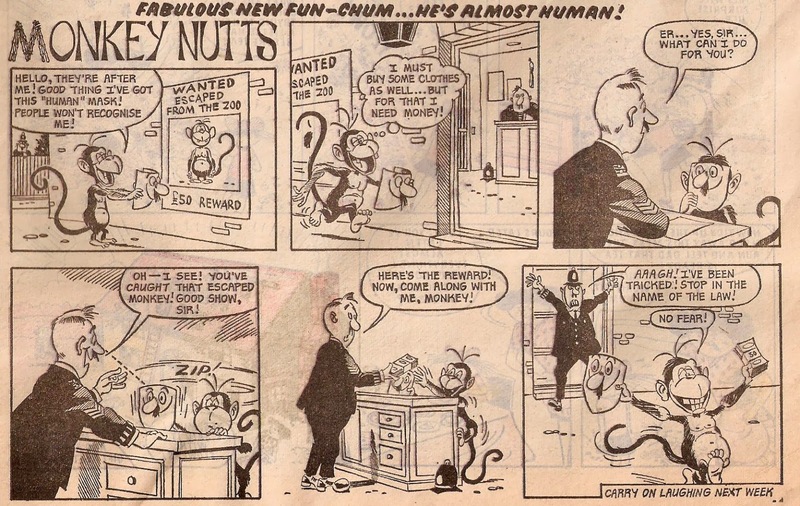 And first up is Monkey Nutts, a half pager that followed Kings of the Castle. I'm unsure of the artist on this one, it may perhaps be Graham Allen but I'm not so sure. The next new Whizz-Kid appeared on the other side of Chips, and was Jimmy Jeckle Master Hide. 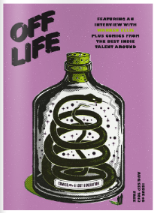 Illustrated by Terry Bave, I think the title is rather self-explanatory - it's about a kid called Jimmy who develops the potion and (for some reason) drinks it, which turns him into Master Hide. 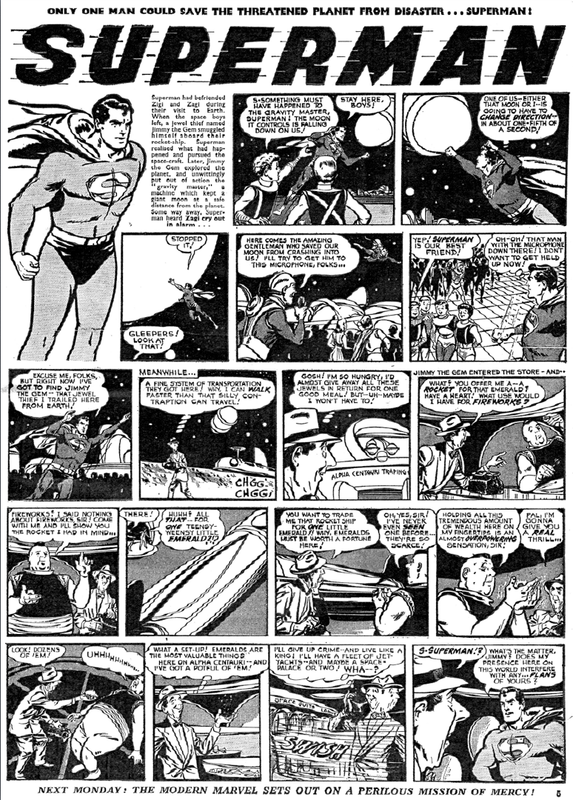 The Chip-ites retaliated to the new Whizzer characters with two new full-page characters. 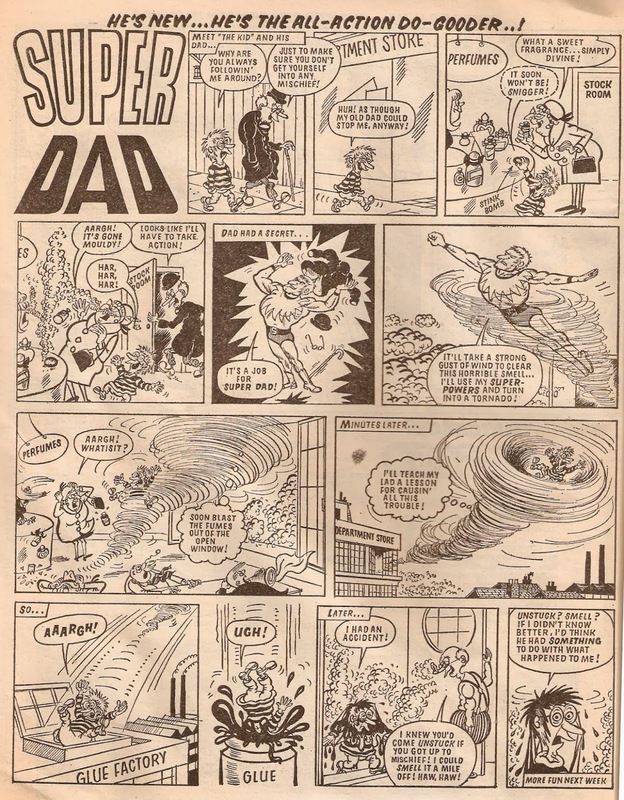 The first would go on to be a very popular and long running strip - Super Dad. "The Kid" looks very much the same at the start of this run as he did at the end of it, but Dad changes considerably when Mike Brown illustrates the strip later on. This first strip doesn't look like Mike's work though, the background characters suggest it was drawn by Norman Mansbridge. The other new Chip-ite(s) would endure an even longer initial run than Super Dad; The Scareys Of St. Mary's would last all the way until 1977. 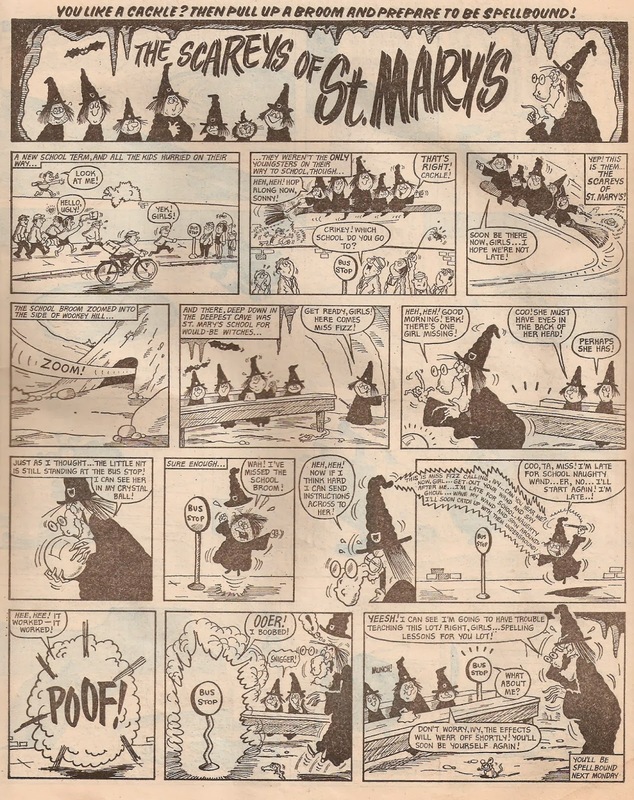 Illustrated by Terry Bave, the Scareys are a group of Witches that attend St. Mary's, a school of witchcraft - something like an early Harry Potter, in a way. 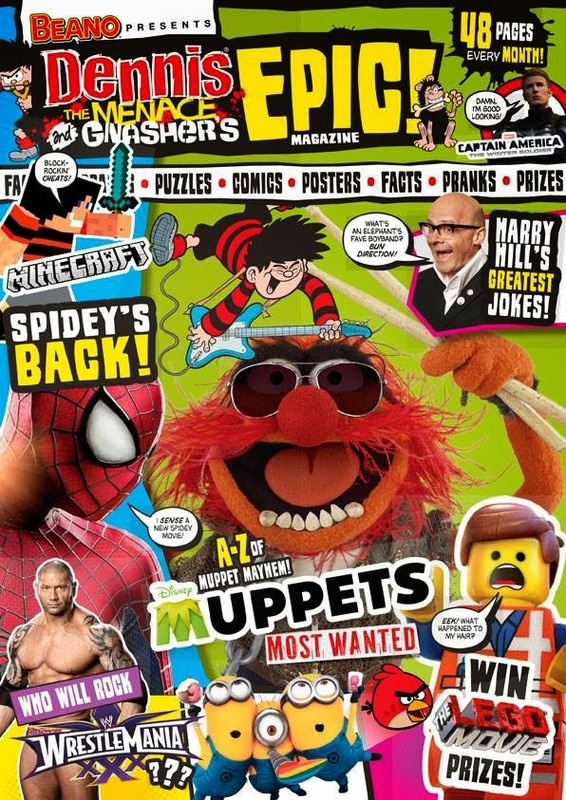 After just eight issues the Dennis the Menace and Gnasher Megazine has gone through a name change, perhaps suggesting sales aren't as high as anticipated. As of issue nine the comic will now go by the name of Dennis the Menace and Gnasher's Epic Magazine - an even longer title than before! 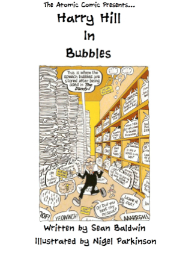 The cover of issue nine can be seen in the blurry picture above, and to be honest it's very disappointing, with everything just looking like a horrible mess, as though somebody accidentally dropped all the issue's images onto the front cover, and just decided to leave them there. 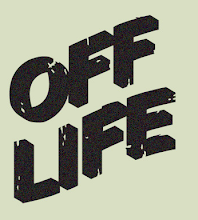 I have no idea what changes, if any, the new name will bring to the comic. The price tag is still the same of £3.99 a month. 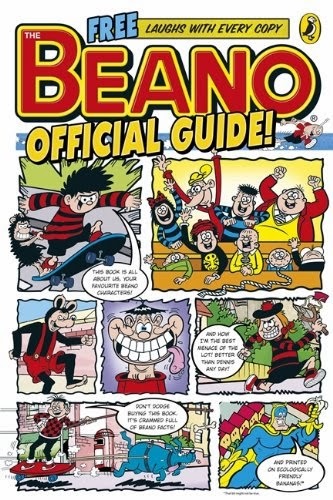 Puffin books have announced The Beano Official Guide that will be released at the same time as the annuals later this year. Not a replacement for the Beano and Dandy books published by Thomson, this guide will cost £7.99 and is due for release on 7th August, although pre-orders are available from Amazon now. 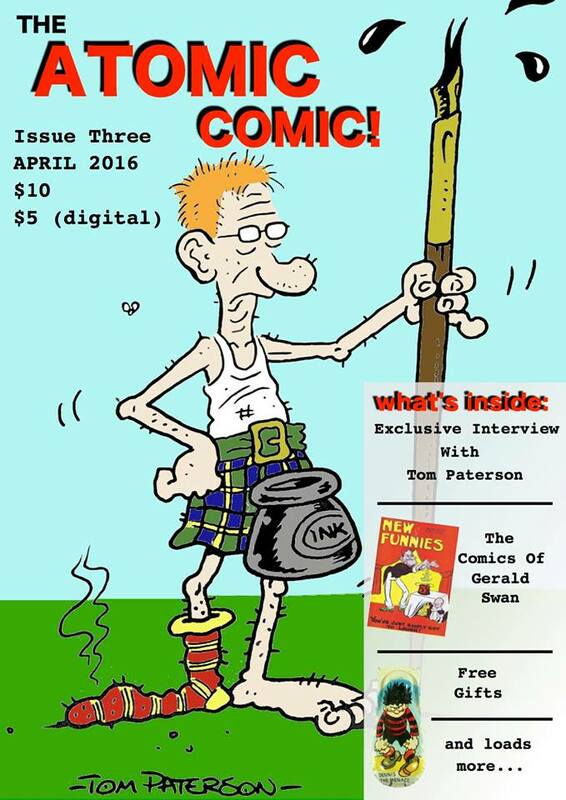 "Whether you're young or not-so-young, you probably already love The Beano! Now you can final out all the facts, fun and faces that have kept the nation laughing every week for more than 75 years. This is such an important book that even Dennis the Menace himself has taken the time to scribble his thoughts all over it, providing a rare insight into his fellow Beanotown residents. From Bananaman and the Bash Street Kids to Minnie the Minx and Calamity James, they're all here. 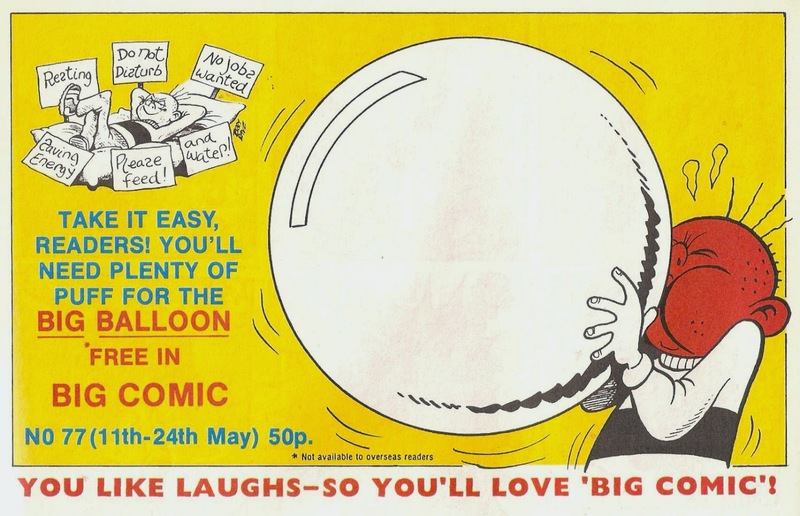 Also included it loads of rarely-seen artwork, dug up from The Beano's humongous and heavily-guarded archive!" With the promise of "rarely-seen artwork" I'm eagerly awaiting the arrival of this book, and at £7.99 it sounds like a bargain, £5 cheaper than Thomson's own Beano and Dandy book.